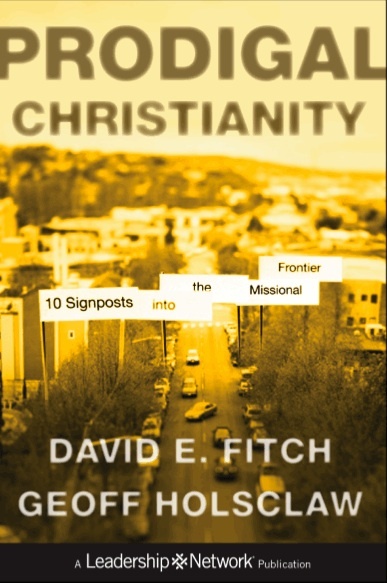 This post is the fifth stop on a blog tour reviewing Prodigal Christianity, by David Fitch and Geoff Holsclaw. Check out the first four reviews here, here, here and here. Then please, read this book. I first met Pete when we turned our church building into a temporary winter shelter. Pete is a straight-forward 61-year-old homeless man who bears the trappings of a hard lived life. After a day or so, he pointedly confessed he wasn’t a christian and had no interest in becoming one. His experience in various church-sponsored sheltering programs were not much to brag about, but he supposed a “warm building even filled with cold people” (referring to Christians) was better than a cold night’s sleep. So he kept showing up. With those words we hugged, and Pete left for New Jersey for the next carnival season. If I am reading it right, I think this is what Holsclaw and Fitch are getting at in their chapter entitled, “Signpost Five: Scripture.” Far too long we have treated Scripture as the Church’s inerrant and infallible constitution of God-inspired authoritative propositional truths to be both proclaimed and practiced, rather than “a dramatic unfolding of the story of God’s redemptive work in and for the world” (69). In doing so, we have made Scripture into a “disincarnated text addressed only to our minds, making disincarnated disciples who are more concerned with proper ideas than they are with missional lives” (69). At first glance this provocative statement looks quite harsh, but if you were to meet Pete he would say the same thing, just with different words. Like many in our current culture, the Bible has no place of authority in Pete’s life, and persuasive or rationalistic arguments proving that it should just fall short. So what do Fitch and Holsclaw suggest? See, Pete is familiar with the truths of Scripture–don’t lie, don’t get drunk, love your neighbor, and the like. He has met many christians who set out to obey these commands and suggests he do the same. He even believes that the bible is “God-breathed.” But what Pete is unfamiliar with is how the grand narrative of Scripture, along with it’s embedded truths, works itself out in real life, or perhaps better put, how it works our lives out in the story God is telling. Instead of only commanding that we live a particular way of life in our world, Pete needed to see that Scripture invites us to participate in the world God is re-creating in and through our lives as citizens of His kingdom. Then Scripture can be received as an extension of Jesus’ person and work in the world as it connects us to the reality of God and His mission, and shows us what kind of life really works when God is king. In my view, Fitch and Holsclaw flesh this out well, both in theological and practical detail. As you read this chapter you may be confronted with the same realization Holsclaw shares when he realized that we spend a great deal of time interpreting Scripture and not enough time allowing it to interpret us. This is not to say we should avoid interpretation. Holsclaw suggests quite the contrary. However, he encourages us to be careful not to seek control over Scripture as an idealogical text and learn to discern the Bible as our own story, as the story of God’s in-breaking kingdom. This discovery is essential if Scripture is to possess any transformative authority in our lives, because it’s authority is “a principal component through which the kingdom comes” (78). When we come to understand Scripture as the redemptive story God is telling, we are compelled to submit to it’s authority as we participate in this unfolding story as His people. Now, the authority of Scripture moves beyond propositional truths to be obeyed and comes to us, by the power God’s Spirit, as the product of God’s mission in King Jesus. Scripture begins to live and breath as it becomes the means by which we join God in what He is doing all around us. When we do this, we put skin on the story God is telling and His kingdom is made tangible to those inhabiting where we live, work and play. What Pete did not know is that it was never God’s intent to merely inform us with Scripture as much as it is His intent to form us by Scripture, as through it He invites us to live what appears to be an upside-down way of life in a world convinced it’s right-side up. This view of Scripture gives birth to a community submissive to love, instead of lambasting; mercy, instead of malice; compassion, instead of conjecture; grace, instead of grumbling. Yes, as God’s story becomes our own, we begin to listen, love and live from our place within it. This changes everything. And it can change anyone. Even Pete. Make no mistake, in this chapter you will find that Fitch and Holsclaw hold the highest view of Scripture. They are suggesting what I believe to be a more robust and faithful way of seeing, embracing, and proclaiming Scripture in a post-christian culture. If we join them in this journey toward prodigal christianity and follow signpost five, we will affirm the authority of Scripture as the result of God’s mission in Christ, and together live in such a way that the Petes’ of our world will only be able to surrender to or reject, but certainly unable to deny. I have found an odd disconnect between many post-moderns and how they view scripture. Post-moderns tend to have a high criticism of rational, scientific, and logical thought when it comes to discerning truth. So, when it comes to rational, scientific and logical reasoning to support the authority of Scripture, they are the first to shoot it down. And yet, their own arguments against Scripture as authority are also grounded in the same Enlightenment processing of reason, science, and logic. So… when it comes to that, I think the way forward given by Fitch and Holsclaw is a much better way. Rather than engaging in endless logical debates, simply engage the stories and bring the stories to bear. Yeah, it’s sometimes hard to make sense of Scripture.. but isn’t that the case with most things in life? Thanks, Fred, for this excellent post! Well said, Robert. I especially like your idea of engaging the stories and bring them to bear as opposed to simply debating on logical grounds. I look forward to reading your posts now that we are connected! Grace and peace to you, bro. Breaux, I am humbled by your encouraging and gracious words. God has been good to us and I pray we continue to remain joined in His pursuit of restoring lives. Much love to you, my brother, my friend and my partner in the gospel.